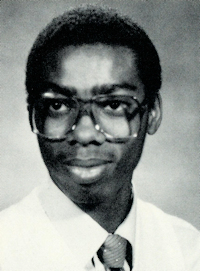 Obituary – Johnson, Delton Delano « Perry High School Alumni Association, Inc.
Delton “Duck” Johnson, 42, of Columbia died Tuesday, Oct. 23, 2007, at University Hospital. Services will be at 1 p.m. Friday, Oct. 26, at Warren Funeral Chapel with Elder Melvin Stapleton Jr. officiating. Duck was born Sept. 27, 1965, in Wichita, Kan., to Billy Ray and Dorothy Cole Johnson. He later married Danesse Johnson. He was a member of Wrights Temple Church of God in Christ. He was formerly employed at Alpha Gamma Delta fraternity. Survivors include his wife; a daughter, Shamon Johnson of Columbia; three brothers, Rodriques Rocky Johnson and wife Anna Mae, Retez Pee Wee Johnson and wife Terra, both of Stillwater, Okla., Billy D. Johnson and wife Sheila of Columbia; step-brother Arthur Williams Scott Jr. of Franklin, Tenn.; a sister, Antreasa M. Chipa and husband Daandro of Nashville, Tenn; stepmother Bessie Johnson of Franklin, Tenn.; and several aunts and uncles. He is preceded in death by his grandparents, mother and a daughter.